The Discovery HS PTSA would like to say welcome to both new and returning families to Discovery High School for the 2018–2019 school year. We hope that you had a fun and restful summer and are looking forward to another school year here at Discovery. The goal of the Discovery PTSA is to support and encourage our teachers, provide fun events for students and their families, and lead fundraising efforts to help make our school successful. 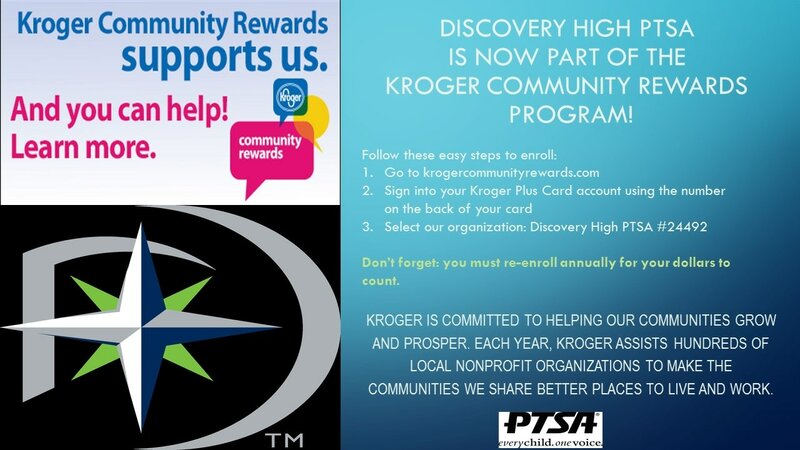 We invite all members of our Discovery family and community to get involved. Through the money we raise from our activities and our involvement at the school we are able to invest in our children’s futures. If you would like to help make a difference for our children please join the PTSA! Membership is open to everyone; parents, teachers/administrators, students, and community members. It is only $10.00 to join for each person! Please take the time to visit the PTSA website and review our calendar of events. We would love to see and hear from you. If you have any questions or concerns you can reach us through our Facebook page or by email at discoveryhighptsa@yahoo.com. * Discovery HS currently has 2500+ students. * Discovery High PTSA gained 132 members; 95 were faculty. * Donated to assist the Black History Month "Living Museum"
Are you a Discovery HS student or parent? Please complete our survey and tell us how you want your PTSA to support you. The major source of PTSA funding is your membership! Discovery High PTSA promotes education and extra-curricular activities at our school. These programs are funded solely by the membership drive and school-wide fundraisers. Our parents work very hard to raise money for educational supplies & scholarships, athletic equipment, student activities, and staff appreciation at Discovery High School. If one person from every household joined the PTSA, we could raise over $26,000 to be used to reach our enhancement goals. Membership is open to ALL to join! Help us exceed our goal of 200 members! We want your financial support. If you are interested in serving on the PTSA Board, please use the Contact Us web form to let us know. Want to volunteer but don't have a lot of time? Consider our "One and Done" program. Consider donating your time to a PTSA committee. See our volunteer page for more details. Volunteering is not a requirement to become a PTSA member! Make a contribution to the Discovery HS PTSA by clicking the Donate button.